If you are going to the Sentosa Spooktacular 2012, embark on Spooktacular Quest in your visit and GET REWARDED by hunting for their resident ghosts using “SentosaLens”! Try scanning the image below for a sneak preview of Augmented reality! – Point your phone to the image and see what pops up! – Freeze them in a snapshot so they won’t follow you home! – Collect points when you scan the markers and redeem them at selected outlets at Spooktacular. Consider this a reward for your bravery! 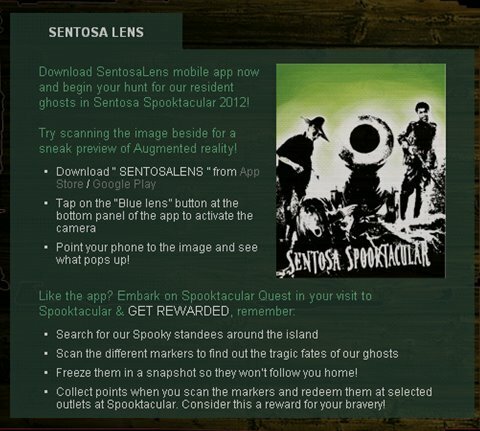 Download SentosaLens mobile app now and begin your hunt for our resident ghosts in Sentosa Spooktacular 2012! For more information, check out Spooktacular website.